Chelsea captain Terry said recently that Jose Mourinho's side are looking at players such as Stones as ones "for the future"
It would be a "fantastic" move for John Stones if he was to switch to Premier League champions Chelsea from Everton, according to Alan Shearer. Stones, 21, has been publically courted by Chelsea, much to the annoyance of Everton manager Roberto Martinez. "He would be playing under the best manager in the Premier League," said former England captain Shearer. "And he'd be watching and learning from the best centre-half there has been in the Premier League in John Terry." Shearer, speaking on Match of the Day, added: "I've heard it said by Rio Ferdinand that it would be a bad move to go to Chelsea. I think it would be a fantastic move." 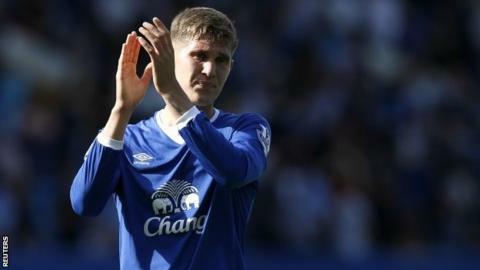 Stones, who made 23 Premier League appearances last season, still has four years to run on his current Everton deal. He was bought for £3m from Barnsley in 2013 and has since won four senior England caps. Mourinho confirmed a bid by the Premier League champions had been made - and was reportedly rejected - saying: "We made a bid because we like the player." The centre-back played in Everton's 2-2 opening-day draw against Watford on Saturday, and was praised for his performance by Shearer's fellow Match of the Day pundit Danny Murphy. "Overall he was calm, elegant, like he always is, and there as nothing in his performance which said he didn't want to be there," said the former Liverpool midfielder. "I'm a big fan of his. He's a clever footballer. He doesn't just boot it out of play. He's a thinker and a good athlete. "He can play in that Chelsea team. He wouldn't go to make up the numbers. For me, he would get in ahead of Gary Cahill."